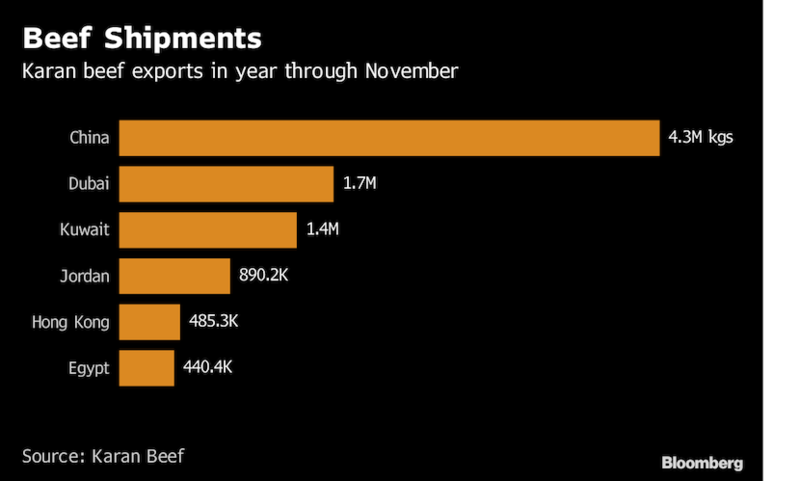 (Bloomberg) – The world’s largest cattle feedlot is expanding South African beef exports beyond the Middle East to take advantage of surging demand in China and other Asian markets. Karan Beef (Pty) Ltd.’s feedlot south of Johannesburg is emblematic of a push by South African agriculture to boost exports of more niche products ranging from grapefruit and avocados to macadamia nuts. Increasingly, the emphasis is on high-value products rather than mass output of less lucrative crops like corn. 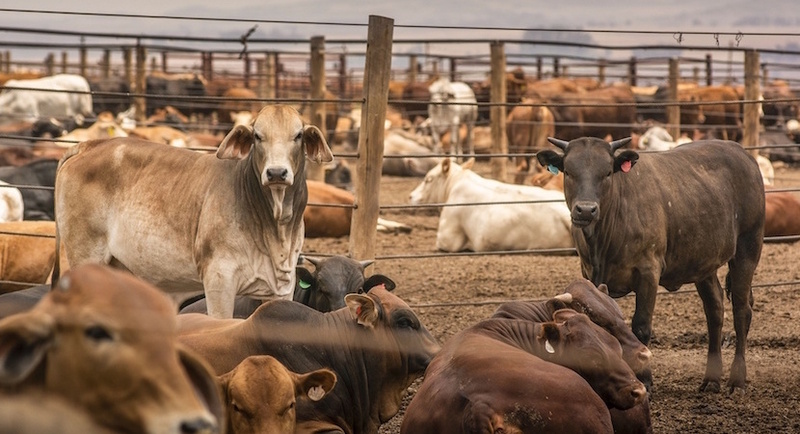 With 160,000 cattle on the property, which converted from dairy to beef production in about 1980, and half a million of the animals sent to slaughter every year, the 2,500 hectare (6,178-acre) operation is the biggest feedlot on a single site globally, according to director Matthew Karan. The cattle are acquired from farmers around the country at about 8 months old. They’re more than doubled in weight to about 420 kilograms (926 pounds) within four months with feed including molasses and gluten mixed in a production line-like factory that sees specially equipped trucks constantly topping up troughs in the pens. The operation accounts for 70 percent of South Africa’s beef exports and 30 percent of the local market. The business has been exporting beef to the Middle East since the early 2000s and last year won access to China, doubling export volumes, Karan said in an interview at the feedlot. In the year to November it shipped 4.34m kilograms of beef to China and 4.68m kilograms to the Middle East. The company has had to work hard to promote South African beef, which is generally lean and “rose” in colour due to the local grading system, he said. That compares with the more marbled meat from the US and Australia, which contains more fat. The South African beef industry more broadly is under pressure to increase production to meet local and international demand, said Gerhard Schutte, Chief Executive Officer at the Red Meat Producers Organization. One possibility is building capacity of small-scale farmers, who own about 40 percent of the nation’s livestock, but lack the competitiveness required for export markets, he said. In October, the Karan family agreed to sell a 90 percent stake in the business to the Public Investment Corp., Africa’s biggest fund manager and the custodian of South African civil servants pensions, and black-owned Pelo Agricultural Ventures for R5.2bn ($374m) in one of the biggest attempts yet to address the legacy of apartheid in South African farming. The deal is the PIC’s largest to date in the agriculture sector, said head of corporate affairs Deon Botha. The family will continue to manage the business for the foreseeable future, said Karan. An earlier offer of R6 billion for the entire business by Chinese investors who wanted to export all of the output was rejected, he said.